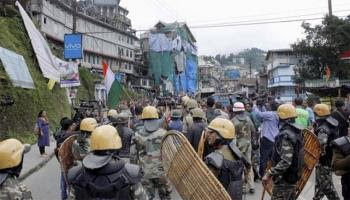 The high court today asked the Union government's counsel to convey on July 8 the Centre's decision on the state's demand for additional paramilitary forces for deployment in the hills. Yesterday, a division bench headed by acting Chief Justice Nishita Mhatre had asked the lawyers of the central and state governments to decide on the Mamata Banerjee dispensation's demand for more forces. The state advocate general, Kishore Dutta, today informed the court that on the basis of yesterday's request by the division bench, he had sent a list of total state and central security forces currently deployed in the hills and the quantity of additional paramilitary personnel required to maintain law and order. Justice Mhatre then asked the additional solicitor general, Kaushik Chanda, who appeared for the Centre: "What decision your government is taking on the state's request for more central forces?" Chanda replied: "The central government needs time to consider the request. Please fix the matter for hearing on July 10. I will try to inform the court about the central government's decision on the matter on that day." But Dutta urged the acting chief justice to ask the Centre to take the decision as soon as possible.